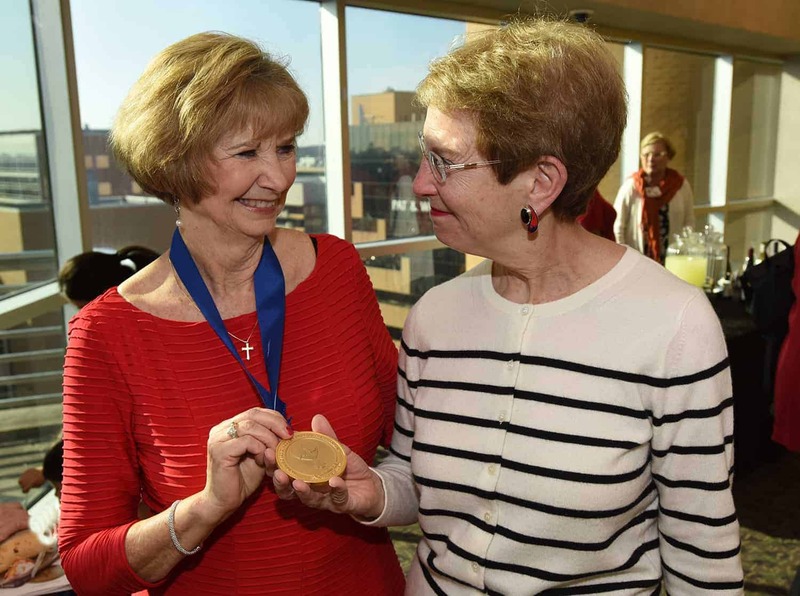 Jean C. McSweeney, Ph.D., R.N., professor, associate dean for research and co-director of the Ph.D. program in the UAMS College of Nursing, shows off the medallion from her investiture in the Women's Cardiovascular Health Professorship to Jeannette M. Shorey II, M.D., associate dean for faculty affairs in the UAMS College of Medicine and associate provost for faculty. 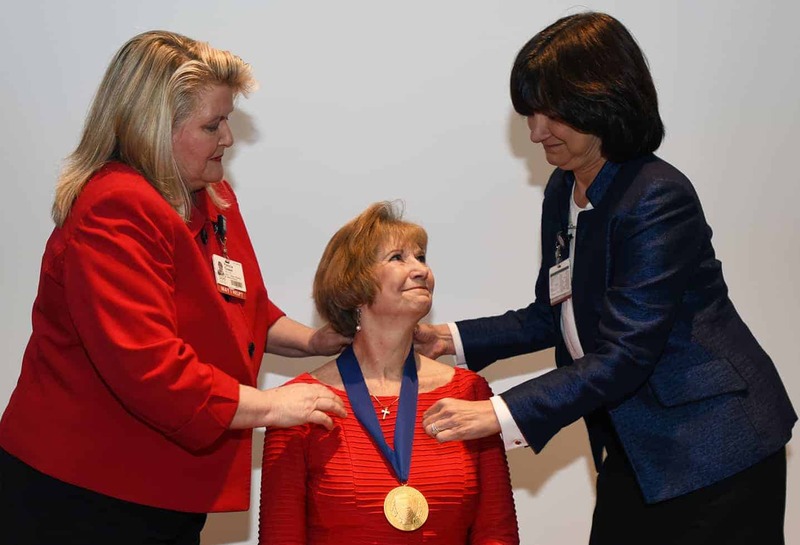 March 15, 2018 | March 15, 2018 | Jean C. McSweeney, Ph.D., R.N., professor and associate dean for research in the University of Arkansas for Medical Sciences (UAMS) College of Nursing and co-director of its Ph.D. program, was invested March 12 in the Women’s Cardiovascular Health Professorship. According to the U.S. Centers for Disease Control and Prevention, heart disease is the No. 1 cause of death for women in Arkansas. The professorship will support UAMS’s recruitment of more cardiovascular researchers, studies to improve treatment and health outcomes for women with cardiovascular disease, and educational opportunities to illuminate women of the risk factors and symptoms associated with cardiovascular disease. McSweeney is an internationally known researcher with more than 20 years of experience in women’s cardiovascular disease. She was the first to identify different heart attack symptoms for women in a 2003 study published in the American Heart Association’s premier journal, Circulation. In 2016, she chaired the first American Heart Association Scientific Statement fully devoted to cardiovascular disease in women. The statement concluded more research, improved diagnostic equipment and early recognition of symptoms is needed to identify and treat women with cardiovascular disease in order to improve outcomes. This professorship supports McSweeney’s continued efforts to enacting the statement’s suggestions. McSweeney was invested into the professorship by Patricia Cowan (left), Ph.D., R.N., dean of the UAMS College of Nursing, and interim UAMS Chancellor Stephanie Gardner, Pharm.D., Ed.D. “This means this research can go on forever and that’s what we need,” said McSweeney. 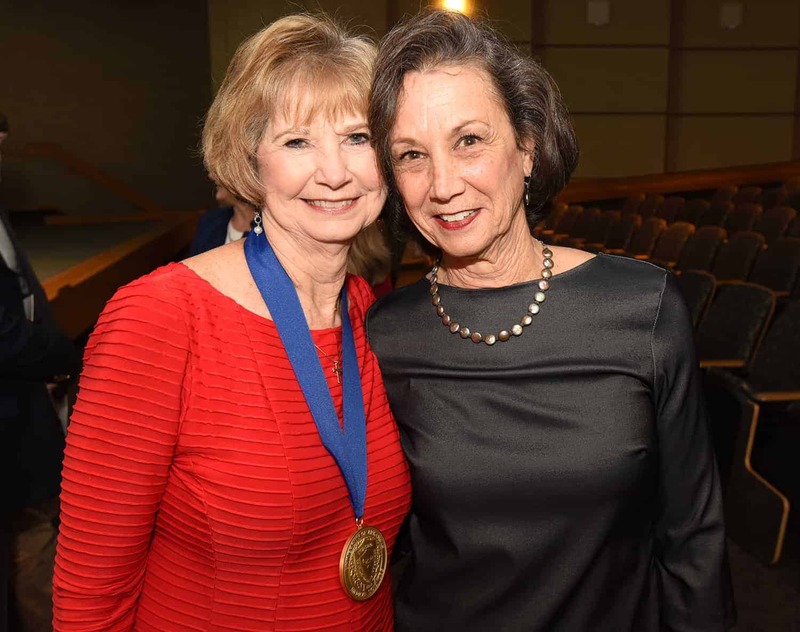 She was presented the professorship medallion by interim UAMS Chancellor Stephanie Gardner, Pharm.D., Ed.D., and College of Nursing Dean Patricia Cowan, Ph.D., R.N. Cornelia Beck, Ph.D., R.N., a retired UAMS College of Medicine and Nursing faculty member, renowned researcher and close friend of McSweeney, said being a compassionate listener is what enabled McSweeney to identify women’s different symptoms and to use this research for the benefit of others. Caring about women’s difficulty getting diagnosed with heart disease is what drove McSweeney to many accomplishments throughout her nursing career, Beck said. McSweeney has received continuous funding from the National Institutes of Health’s (NIH) National Institute of Nursing Research since 1999, and previously served on its advisory council. She’s also received numerous grants from the American Heart Association, Sigma Theta Tau International and the American Nurses Foundation. She was the second nurse, and first Arkansan, appointed to the NIH’s Council of Councils, which advises the NIH director, and is the former director of an NIH-funded Center for Bio-behavioral Interventions. It is the correspondence and personal stories from hundreds of research participants, McSweeney said, that continues to push her to do more in women’s cardiovascular research and treatment. McSweeney shares a moment with long-time friend and former colleague Cornelia Beck, Ph.D., R.N., a retired UAMS College of Medicine and Nursing faculty member and renowned researcher. She is a Fellow in the American Heart Association and the American Academy of Nursing, and a member of several professional organizations. McSweeney is past president of the Southern Nursing Research Society and serves as chair of the Central Arkansas American Heart Association Board of Directors. .
McSweeney has presented her findings across the United States in such venues as the National Heart Attack Alert Coordinating Board, served as a discussant for the National Heart, Lung, and Blood Institute’s Women’s Ischemia task force, and was a featured speaker at the National Institute of Nursing Research’s 20th Anniversary Symposium. She has been at UAMS for more than 20 years and served as the College of Nursing’s interim dean for most of 2015, prior to Cowan’s appointment in November of that year. McSweeney helped develop the doctoral program of the College of Nursing.